Commercial Building Customers To Discuss The French Plan For The Construction Of The Complex. modern talented French architects present their project to build a business complex customer investors, representatives of the municipality. 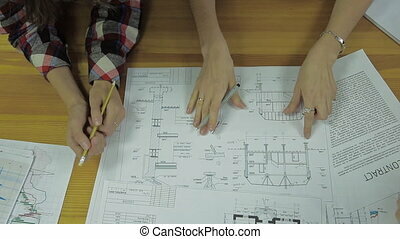 They will talk about the idea of building and architecture, in front of them on the table lay a blueprint sheet layout and beam ceilings in the facility. Three adults in search of the perfect solution concept. sitting behind a large wooden table and talk actively working with the drawings, few lay concrete slabs, ceiling height, room size. 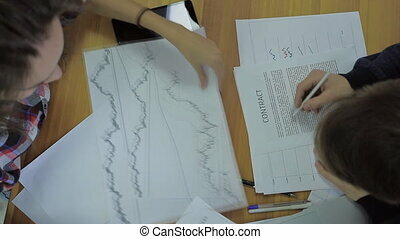 Close-up Of Two active Businessman Analyzing Graph consultants in finance and securities market, working behind a wooden desk in the main office of the financial analytics company, actively working with charts, tables, diagrams, tablet lies nearby. they read the contract carefully and build the level of sales and performance for its customers. 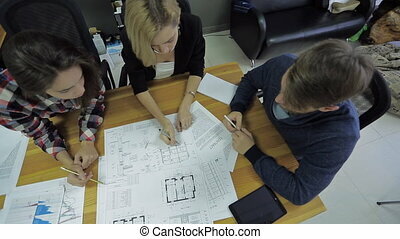 Modern Swedish family with one man and two women, talking and arguing about the location on the plan elements such as balconies and windows at home. Near is a signed contract for this work with architects, electricians and designers, builders. Sit at a wooden table at home. A gold bracelet and rings tell us about the high status of women in the family, which has an influence on her husband, a hot debate on the paper of the layout, which will whose room and make changes to the project. The young woman at the desk in the office assesses the work of young people. She has short blond hair, black and white business suit and jewelry on her arms. 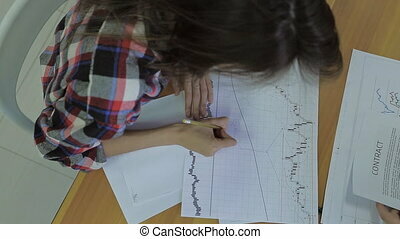 She examines charts and diagrams on sheets of paper, explaining and showing something to sitting nearby. These are man and woman in casual clothes. The girl has plaid shirt and long dark hair. The guy looks like a hipster. Perhaps they are young boss and her subordinates or supervisor of student study group examining how the work is done. Young people discussing something sitting at the table and making notes. These are two beautiful girls and a young man. They are in the office, behind them stands a rack with archival folders. On the table lay some papers and tablet. 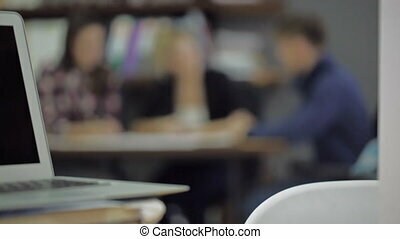 They look attentively, say something to each other, make notes or corrections. They are dressed in modern trendy comfortable clothes, plaid shirt, blue sweater and jeans. 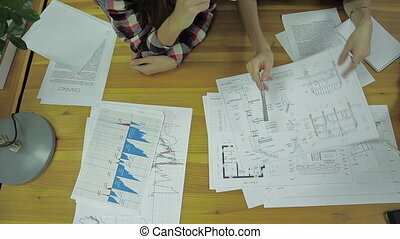 They are students preparing for a lecture or presentation of course learning project. modern stylish businesswoman, with an excellent figure, dressed in an office is the office and work with my phone. maybe that she is responsible for the SMS to its customers may use geolocation, what would make a travel itinerary or she uses social media plays in mobile applications, or just to get, send emails and watching pictures, leave a message, who knows. View close-up, we see part of the office. Pretty nice consultant girl hispanic in hipster office with his male finance senior consultant expert at the meeting, sitting, both at a large wooden table periodically he raises charts, annual reports and state money for its own account, deposit, purses electronic depicted stocks, demand and falling , situated near the tablet. She wore a loose modern, feminine shirt in a cage. 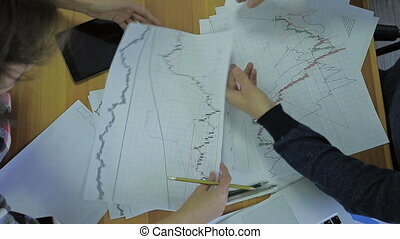 they are training activities of financial flows. 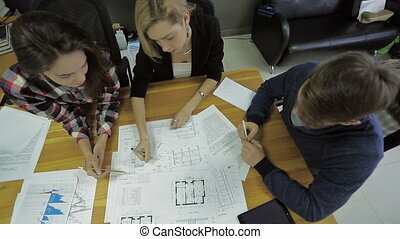 Beautiful nice group of friends are discussing a plan to build the house. 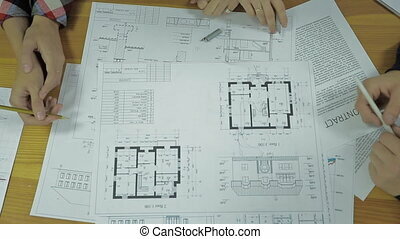 they have to understand the construction and architecture, in front of them are on the table to the layout sheets and forms a contract loan on the house. Three adults in search for the perfect property. sitting behind a large wooden table, raise topical issues, few layouts, covered interfloor ceiling height, room size, the location of windows and doors. Two multi-ethnic women, girls and Caucasian man.